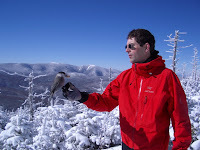 Since many people outside of New England read this blog, you may want to know what I do for fun at this time of year. It's around zero degrees with 25mph winds on Mt. Washington in the White Mountains, so it's time for a stroll. There are 48 mountains over 4000 feet in New Hampshire, so for fun, I climb each of them in the winter. Hikes range from 7 miles up Mt. Tecumseh to 26 miles up Mt. Bond. 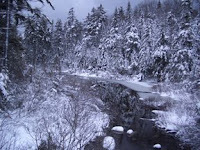 The rules of winter hiking require that it must take place between the winter solstice (Dec 21/22) and the Spring equinox (March 20/21) in order to count as a winter ascent. 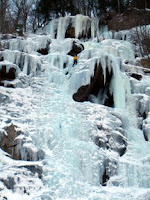 Snow drifts can be 6 feet deep, ice covers every rock up to a foot thick and waterfalls become solid and climbable. Temperatures vary from +20 to -20F. Wind speeds can gust to 70mph. Windchills of -40F are not unusual. At -40F, the battery life of a Blackberry is 2 minutes (I thought you'd want to know), exposed skin lasts about 3 minutes and eyeballs freeze solid. But, there is no such thing as bad weather, just bad planning. Happy Holidays from the land of ice and snow!